It occurs to me to doubt whether the external world exists -- that is, whether anything exists other than my own stream of conscious experience. Radical solipsism is of course crazy. But can I show it to be wrong? Or is my only recourse simply to assume it's wrong, since any attempt at proof would be circular? Can I break out of the solipsistic circle, using facts about my own stream of experience, knowable from within the solipsistic perspective, to license an inference to the existence of something beyond my stream of experience? The most famous philosophical attempts to prove the existence of an external world from solipsism-compatible assumptions and methods -- for example, Descartes's and Kant's -- are generally acknowledged by the philosophical community to fail. I'm inclined to think those attempts fail because they set the bar too high: They aim for certainty through deductive proof. Better, perhaps, to aim lower -- to use scientific methods and scientific standards, licensing only tentative conclusions as the current best explanation of the available evidence. In another way, too, I aim low: I aim only to refute solipsistic doubts in particular, not other sorts of skeptical doubts such as doubts about memory or reasoning. In fact, I will take the general standards of science for granted, insofar as those general standards are compatible with solipsism. I aim to do solipsistic science. Last year on my blog I presented the results of two experiments designed to provide evidence that an external world does indeed exist. The first experiment suggested that something exists ("my computer") that is swifter than I at calculating prime numbers. The second experiment suggested that the world has some constancy to it that exceeds the constancy of my memory. Today, I will report on a third experiment. If solipsism is true, nothing in the universe should exist that is better than I am at chess. Nothing should exist with chess-playing practical capacities that exceed my own. Now I believe that I stink at chess, and my seeming student "Alan" seems to have told me that he is good at chess. If solipsism is true, then he should not be able to beat me at rates higher than statistical chance. 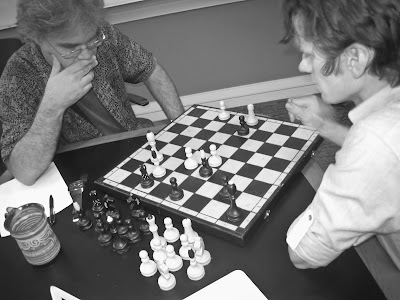 I agreed with this seeming-Alan to play twenty games of speed chess, with a limit of about five seconds per move. The results: seeming-Alan won 17, I won 2, and one stalemate. 17/19 is statistically higher than 50%, p < .001 (hand calculated). It occurs to me that I might have hoped to lose, so as to generate results confirming my preferred hypothesis that the external world exists. Against this concern, I comfort myself with the following thoughts: If it was an unconscious desire to lose, then that implies that something exists in the universe besides my own stream of conscious experience, namely, an unconscious part of my mind. So radical solipsism is false. If it was, instead, a conscious desire to lose, I should have been able to detect it, barring an unusual degree of introspective skepticism. What I detected was a desire to win as many games as I could, given my background assumption that if Alan actually exists I would be hard pressed to win even one or two games. I found myself repeatedly and forcefully struck by the impression that the universe contained a practical intelligence superior to my own and bent on defeating me -- an impression, of course, confirmed by the results. The most natural scientific explanation of the pattern in my experience is that that impression is correct. I might easily enough dream of being consistently defeated in chess. But dreams of this sort, as I seem to remember, differ from the present experiment in one crucial way: They are vague on the specific moves or unrealistic about those moves. In the same way, I might dream of having proven Fermat's last theorem. Both types of case involve dream-like gappiness or irrationality or delusive credulity -- the type of gappiness or irrationality or delusive credulity that might make me see nothing remarkable in my daughter's growing wings or in discovering a new whole number between 5 and 6. Genuine dream doubt might involve doubt about my basic rational capacities, but if so such doubts are additional to simply solipsistic doubt. Whether I am dreaming or not, if I consistently experience specific clever and perceptive chess moves that repeatedly exploit flaws in my own conscious strategizing, flaws that I experience as surprising, it seems hard to avoid the conclusion that something exists that surpasses my own conscious intelligence in at least this one area. I have recently been trying to fix a seemingly simple electrical problem in my car. The intractability of which is enough to convince me that more is going on than I understand, or apparently am capable of consciously understanding. Although sometimes I can fix things, in the sense that I stop having that problem. Not in this case, so far. That doesn't show that an effect like this is not derived from my unconscious mind. You would wish me to show that "my car" is not a dream-like creation of my "subconscious", but what would it mean to show that? That is, how far do you allow my "me but not within my conscious process" to extend? I suppose you would like to say that "I" am contained within my body, but how is "my brain" different than "my car"? Some Buddhists and Spinoza say it's all an effect, or affect, of the "One Mind", which is "me" in the largest sense. So to speak. That is, no "external" world. Nie? Thanks for the comment, Marshall. This experiment is not designed to get at the question of the nature of the thing outside my conscious experience. It's consistent with the results that it is only my unconscious mind, as you point out! There's a pretty quick argument here that you are in fact God. Tony, I'm pretty sure that argument wouldn't be sound, but lay it on me! 1) I am insane and all these things I think are connected are gappy like dreams. @ Scott: Wait, I am a robot! @ GNZ: Yeah, that's pretty radical. I can't claim that this approach would serve against more radical views like that. What's so epistemologically special about chess, by the way? Would the existence of a faster typist prove the existence of an outside world? The existence of a better father? The fact that Usain Bolt is probably going to beat you in a sprint? My four-year old is far more athletic than I, his distinguished couch potato ancestor. But I wouldn't want to burden him with being definitive proof of the existence of reality. Congratulations on that score to Allen, by the way. "But dreams of this sort, as I seem to remember..."
Surely this is where things fall apart? Obviously if you're always dreaming, then there is no sense in dreams "seeming like" anything, any seeming at all is dream-seeming. Perhaps one reason that Descartes and Kant aimed at "certainty" is that no-one is actually a solipsist, that solipsism is best described as a nagging doubt rather than as a position that has actually been held. So, a second concern here is that you're refuting no-one: in providing inductive evidence against solipsism, you're confirming what everyone has thought all along, i.e., that solipsism is probably false. Thanks for the continuing comments, folks! @ Anon Aug 15: The thought is that although the sensory experiences I associate with seeming-Alan may only be part of my conscious experience, the chess skill that organizes them must be rooted in something that extends beyond my conscious experience. And yes, faster typing would do, if only it could be established. But trying to prove the existence of a faster typist by, e.g., having an experience as of watching someone quickly tap a keyboard, doesn't seem to work. That seeming typing could all just be a feature of my conscious experience; there's nothing compelling appeal to an organizing structure beyond. @ Vanitas: You might be right about dreams. That's why this is about simple solipsistic doubt rather than full-on dream doubt. Also: In my view refuting positions no one believes is part of the job description of the philosopher. So also, sometimes, is defending positions no one believes. I think there's one objection that needs to be considered. As a conscious mind you have certain ideas, such as Amnesia, that imply you can conceptualize of your mind or consciousness including more than what you immediately have access to. Essentially, you as a consciousness can realize that you don't have an accurate grasp of your own outer limits, and as a result must consider the possibility that your chess skills are better at the periphery of consciousness or better within the stream. That would be backed up by one side having a serious advantage over the other, and an inference to the best explanation could be made that you were more panicked over your own moves then your "opponent's", making them better. As Anonymous said, "I can be in multiple states..." albeit dismissively. Because a solipsist acknowledges that he can't step out of his own mind to observe himself, he has no way of guaranteeing his conscious is in any kind of cogent or static state. Thus a mind divided can still be compatible with solipsism. and no one else seems to be wrapped up in the problem that the awareness we have is found only in ourselves. So is our Mind just an infinitely creative studio producing a variety of shows ? by torturers and begin to torture him all the while promising him that you will stop once he admits you exist and have the free will to stop the torture once he does so. your existence and freedom of the will. we imagine all that is. it does not, I can only suggest you find a friendly, but efficient, philosopher to torture you until you admit the most obvious truth there is - you are not God nor were meant to be. @skanik: Duns Scotus may be forgiven for not having access to the tons of studies that show that torture is a grossly inefficient method of gaining accurate information. You may not. Take another philosopher who believes that people are real and predetermined and start torturing him until he changes his mind on that score. In fact torture him until he admits that the sky is pink, water is dry and the borogroves gyre and gimble in the wabes. That won't take long either. People being tortured will say whatever they think the torturer wants to hear. What they say does not constitute data. What are we really saying by this? Yes, GNZ, I think that the next move if the project is to be built on. If I can establish that there's a mind defeating me, then I can try to assess whether it is my mind (whether a conscious part, maybe, or unconscious) -- and then I need to consider plausible criteria for what it takes for a mind to be "mine". I'm glad I decided to follow up. I can actually give you a chess based analogy. I sometimes play chess games against myself as I know no one of roughly equivalent skill level (Chess is like tennis that way) and interest to play against. I recall one specific and interesting game, in which Black seemed to garner the upper hand against White by capitalizing on forcing the retreat of my white queen and the sacrifice of a couple pieces on A-D side. Black seemed on the verge of winning, and I expected Black to, but as the white player I decided my only option was a gamble to try and win by pressing black from the mostly open E-H side and striking more quickly and precisely than Black could. As the black player, my psychology was to press the advantage I currently had and try to carefully overwhelm my opponent. As the white player, my psychology was to draw out my opponents eventual victory and slip a couple pieces past him for a guerilla style victory. White's gamble paid off as Black could not bring his knights and rooks back fast enough to counter White's aggressive push. The success of white's strategy relied on two things: The fundamental nature of the chess game I was playing whether it was inside my mind or not, and the ability of myself to separate the strategy of the white and black player in my own mind. Black could not know immediately White's plan, or else it would be easily countered and not represent the normal conditions of a chess game and be unfair to White. However, I could not simply deny Black the chance to detect White's strategy or else Black would not be able to ever respond and would be left unfairly open. At first blush, I would imagine someone reading this would imagine that Black lost because I deemed to allow him to notice White's strategy too late. That might be possible, but I feel fairly confident that I picked the exact correct turn to allow Black to notice too late. This is because of the nature of how I played the game: I turned the board after each player's turn. Turning the board allowed me to quickly place my mind inside each player's perspective and separate them in my mind. White hid the advance of a bishop and a knight under the guise of threatening to capture black's queen. As black's queen danced back and around the board to escape the knight and bishop, they slowly worked their way down the board until a clear turn when they chose to advance down the board instead of pursue the queen. They quickly simulated the classic 4-move checkmate from there. As the white player, I was focused on not tipping my hand. As the black player, I did not realize that the white player was two turns away from checkmate when I made my move away. As the white player again, I realized that my opponent could no longer counter me only once i had turned the board back and weighed my opponent's move. In a way, I stumbled into the checkmate as White. No viewpoints I was maintaining at the time realized what was immediately possible until it was all too late. Sorry, I gave a very winded explanation. To now explain what was at the periphery, you might be thinking it was one player or the other. At some times this may be true, but if we're speaking from pure solipsism there is one more thing to remember; the nature of the game of chess. Both viewpoints were active and opposed in the pursuit of this game, but the actual consequences and possibilities in the middle of the game eluded me for a moment (I made a mistake) and one viewpoint won as a result. Some players are capable of fully visualizing a gameboard as they play. I am not. However, the fundamental nature or rules of chess I can memorize and apply as a game continues. From solipsism, I would consider the board part of my own consciousness, and even though it serves the purpose of giving me a visual representation so I don't have to mentally visualize the board and consider all possibilities with each move, I would consider the parts of the board and the possibilities I'm not thinking about as recessed within my consciousness. The other player's viewpoint can function much the same way, only to come back and bite me and make me lose 17 games. To a solipsist, only my consciousness exists, but I'm not sure what lies beyond my immediate perception of that consciousness, what rules of chess I'm not thinking about or what strategies could be deployed. At the most basic level, those of us who are skeptical are operating from the assumption that I cannot play one side of the game entirely subconsciously, but if my theory of mind is solipsism, I have no way of gauging the capability of my subconscious (using that word in this case to imply whatever else supports and exists within my conscious outside my immediate attention or perception). We are biased by our gauges of other people's subconscious and theories of mind, but from a solipsist point of view how would one expect to label the limits of a recessed viewpoint? It would be a little like me, as the black player, trying to guess the strategic ability of the white player based on the way the game has played so far and my knowledge of myself, then being surprised that the black player exceeded what I thought my own chess skills were to win a surprise come from behind victory, and thus concluding that the white player could not have been me. I have a very formal theory of mind for how this type of phenomenon is possible, as its what I'd like to work on in philosophy post-grad (if I could get accepted and afford it.) I'd be happy to e-mail it to you and talk about it if you want. Thanks for following up, Danny. I guess I'm still hung up on how to keep it perched in the right way on the periphery. If it's the action of a non-conscious part of my mind, then radical solipsism as I've defined it is false. If it's a conscious part of my mind, then it should be introspectively available -- as I think your own black and white strategies probably were, even if you successfully bracketed them. There might be an sweet spot in the middle: conscious but so peripheral as to elude introspection and at the same time much more talented than my centrally conscious cognition. That's an interesting thought, but without a clearer case for it I find it a bit strained. This doesn't sound very interesting. Any solipsist worth their salt will waste very little time doubting the existing of other things. They will, instead, be concerned about the existence of other minds. After all, for over a decade, computers have been able to defeat humans at chess with little effort, and yet few would argue that they have minds. If I want to be a solipsist, I will simply say "sure, you can beat me at chess. That computer can too. Now prove to me you have a mind." Actually, that's an unfair request. It is my burden to prove that you have I mind; but I simply cannot. The assumption that I alone have a consciousness and the bunch of you are just philosophical zombies is completely consistent, internally. And impossible to disprove, no matter how low you set your sights. On the reading of prior posts it would seem that their are those that believe man to be in the possession of a 'common sense' and furthermore that this common sense should be the tool employed in the searching for truths.How very 'common' indeed.Rather,it is the job of the philosopher to pry at the commonly held folk belief with increasing levels of sophistication to find,more times than not,that was thought by the main is not(or quite possibly,not at all).On the test itself:Firstly,there is no continuation of mind;rather there is the divided self ie myself today,tomorrow(or:here,there) etc I dont believe any solipsist would deny this.I will be a better chess player tomorrow than I am today!Secondly,your test presupposes spacetime or rather its limits.These into consideration shows that in the playing of chess I could just be as likely to be playing with a constituent part of my mind.Good try though! Nad eem: As long as the best explanation is something outside the stream of experience, I'll have done what I set out to do, even if that's part of my own mind. Ivan: What kind of solipsism is meaningful to try to refute is a tricky question. But the way my argument is structured here goes from another mind first to another thing second. There's a mindedness behind chess-playing computers too! I'm back again with my Orteguian critique of your question about "the existence of the external world." According to Ortega's metaphysics, the "radical reality" is "my life," your life, the life of each one of us. "My life" is the "radical" reality in the sense that all other realities appear or are "rooted" in it. Now "my life" consists of "I," the person that I am, and "my circumstance," everything that is other than "I," including all phenomena that "happen" or "occur" to "me," such as physical phenomena, mental phenomena, social phenomena and spiritual phenomena. Both "I" and "my circumstance" are "internal" to the radical reality that is "my life." But both "I" and "my circumstance" are "external" to each other. So the so-called "stream of consciousness" can be analyzed into the ongoing interaction of "I" and "my circumstance." Ortega's answer to "solipcism" is that based on some of the phenomena that occur to my "I" or me, "I" can infer that there exist other people who are also "I"s who find themselves "living" as "I"s in the "radical reality" that is "their life." But we also come to realize that we can never be the "I" that is "internal" to the "radical reality of "their life," the "my life" that they are living, but that "I" can only occur as a phenomenon that is a part of "their circumstance," "external" to their "I," but "internal" to "their life." Thanks, Jackson! To some extent, that seems to fit well with the post above, since my leap is to another mind not another physical object. On the basis of what, per Ortega, can I come justifiably to know that I can never be internal to another's life? Ortega uses the example of pain. When I experience pain, the pain occurs as a sensation that I directly experience in my life. When a pain occurs to another person, I can only infer that s/he is in pain by the statements that the other person utters, or the groans, facial contortions, or gestures that the other person makes, but I cannot experience their pain directly. The only exception that I can think of, and Ortega does not deal with this, is that of psychics who claim to be able to do "readings" of other people; that is, they are able to imagine being another person (they sometimes call it "projecting their mind" in your sense), and thus receive impressions, sometimes quite vivid ones, of what the other person is experiencing. But I also wanto to critique your use of the term "world." Ortega distinguishes between "circumstance" and "world." If "circumstance" or rather "my circumstance" includes everything that occurs to "my I" or "me" in the "radical reality" that is "my life," "world" is the interpretation that I make of the circumstance that occurs to me. As I learn the connections among the various phenomena that occur to me I construct a "world" that helps me deal with "my circumstance. Now I may adopt the interpretations that my culture presents to me, but I am free to develop my own interpretations. But in either case, they become "my world." Of course to the extent that my interpretations seem to match those of other people, which I can only infer from their utterances or behavior, I can speak of "our world." But according to Ortega, each person's "world" is separate from that of everyone else's. So one interpretation of "external world" would be the "worlds" of other people, that is the interpretation that other people make of their circumstance, since their "world" as well as "their life" (including "their I" and "their circumstance") is "external" to "my life." I cannot fly without the aid of some technology. Therefore, whether there is a world outside of my mind or not, there is a facet of my mind that has determined that objects, and other versions of myself (people) etc... stay on the ground. Therefore, I can say that something... a force.. or some function of my mind is in place to make sure that the rule of "gravity" apply; not just to me... but to myself as an entire universe. It is in this thought experiment we can determine certain observational functions of my mind remain constant as I observe. So, it follows that the proof required to demonstrate the validity of the extraordinary claim that the world exists outside of the mind should then be agreed upon, at least by myself, and, at least confirmed, by other "people" (also figments of my mind) based on those observational constants that I observe. Matter outside of my mind appears to be substantive. It seems to conform to a certain set of qualities: density, mass, size, orientation... etc.. Therefore, at the very least, I can agree that whatever I am observing to be outside of my mind, demonstrates certain qualities that I can, at least, say to be somewhat consistent with all observations within that class. By default, my worldview as the solipsist is challenged by the extraordinary claim that the world exist outside of my mind. Proof, in this situation would not contribute to, or provide any knowledge or paradigm shift to my life. Whether I believe the world exists outside of my mind or not, I can no more prove to myself that "I' exist any more than I can prove any other "self" to exist. You can't qualitatively substantiate a memory from your childhood as a "thing" within the definition of how I observe objects that appear to be outside of my mind to interact... any more than I can. The problem is not solipsism itself. It's fine as truth for me. There is no requirement to elevate my understanding that my universe is a product of my subjectivity to narcissism or grandeur. The problem is that when the question of realities existence outside of the mind is raised... there is no method by which to test either position... because the phenomena to be proven or falsified has no body of substantive quanta to test. Solipsism isn't true or false... it simply doesn't exist. The solipsist does not exist within the paradigm of falsifiable phenomena. The main reason for the irresponsibility of the posit is because it deals with the concept of "nothing". As nothing can be said of "nothing". No reasonable proof can be made both for OR against it. Because "nothing" cannot be discussed without erring semantically, it is reasonable that Solipsism contains the same logical flaw in that it juxtaposes nothing by attempting to qualify it as something. Logan: For purposes of the argument, we'd like to define solipsism in a strong way, according to which the only that exists is your conscious mind and its experiences -- so if you have an unconscious mind that is setting it up, then solipsism still counts as refuted. Aren't you assuming with Freud that if you are a solopist you are also a narcissist? Just because you're the only thing that exists that doesn't make you the center of the world.